Is there a better alternative to BMI-Calculator? Is BMI-Calculator really the best app in Health and Fitness category? 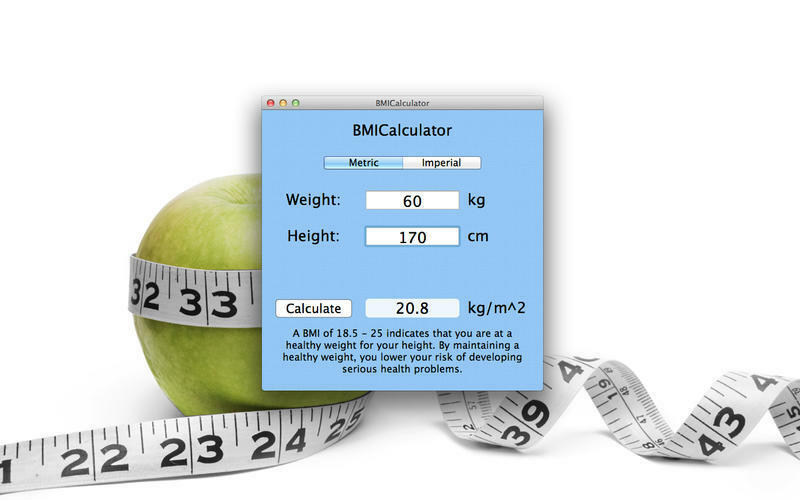 Will BMI-Calculator work good on macOS 10.13.4? BMI-Calculator provides BMI and the corresponding BMI weight status category. Body Mass Index (BMI) is a number calculated from a person's weight and height. BMI provides a reliable indicator of body fatness for most people and is used to screen for weight categories that may lead to health problems. Enter your weight and height using metric or imperial measures. Click "Calculate" and your BMI will appear. BMI-Calculator needs a review. Be the first to review this app and get the discussion started! BMI-Calculator needs a rating. Be the first to rate this app and get the discussion started!